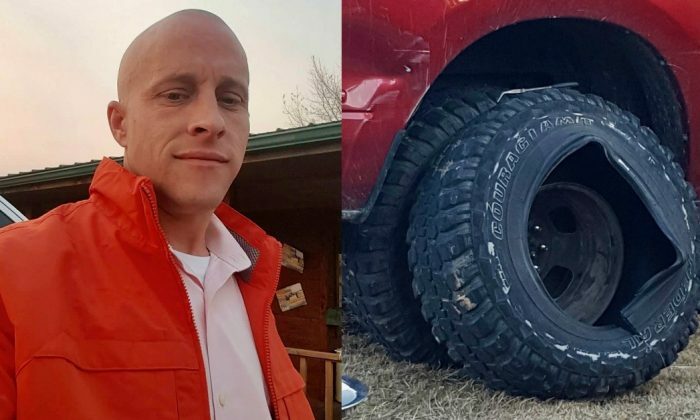 A man was killed when his truck tire exploded on Dec. 23 in Azle, Texas. A child at the home of 39-year-old Ryan Hansen was handing him an air gauge at the time of the accident, according to NBC 5. “The fact that the guy should have probably been doing a double backflip on his motorcycle and died is a guy that was airing up his tires (and died) doesn’t make any sense to us,” Hansen’s friend Marc Humphrey told NBC 5. The exploded tire is a Federal brand Couragia M/T, according to a photo in the NBC 5 report. The Couragia M/T is the tire company’s off-road tire designed for SUVs, light trucks, light vans, and recreational vehicles, according to an online catalog. On Dec. 26, Hansen’s friends and family gathered at Bad Azz Burrito, his favorite restaurant, to celebrate his life, NBC 5 reported. Commenters on the story at NBC 5 expressed their theories for why this could have happened. “The tire appeared to have wear on the outside from rubbing up on curbs, also the tire was oversized for the rim width. Dually wheels are 6.5 inches wide. That tire was too wide for the wheel,” wrote Richard Paul Bristow. Another commenter shared his experience with a tire explosion. “I had a tire on a motorhome explode with me in 2010. Its refereed to by tire people as a zipper blow out. Not a good experience. Absolutly wear heariing protection and eye protection when you air up any tire. Use a remote device with a locking chuck then maintain a minium of 25 feet between you and the tire,” wrote Bill Price.